Corn chips + salsa, corn chips = nacho’s, corn chips solo – the list could go on. It is hard not to love those crunchy savoury bites but the fact is, these tasty morsels are not hitting the greatest of all time on any nutrition list. Before you get all uptight and upset about enjoying food – I agree and I get it, totally. The thing is, if I ate these chips every day of the week there would be additional bits added to my body that I really don’t need. Quite honestly, I have have got enough going on while Hot Cross Buns are on the shelf. Great news ahead though – there is a newish kid on the block in the corn chips world and they are seriously good. What are these corn chips you speak of? Cobs Naked Corn Chips come in two flavours, ‘The Big Cheese’ and ‘By the Sea Salt’ and both are seriously delicious. As soon as I open a pack of these corn chips – boom, they are gone (I think my kids can smell them from 100 paces). They are made in Australia too, which we love. These corn chips are made from corn and ancient grains, quinoa, chia and sorghum. 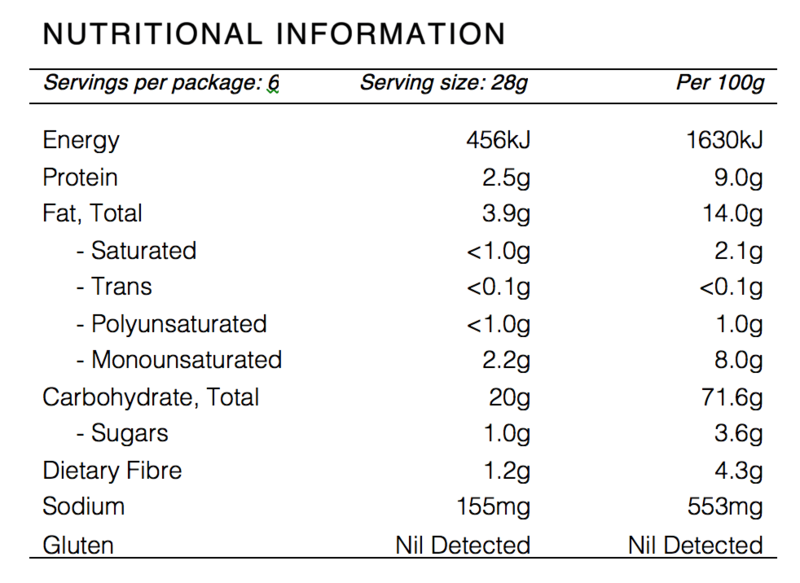 Don’t forget that on a nutrition information label we are looking for less than 8g of fat per 100g serve, less than 10g of sugar per 100g serve and a sodium (salt) content that is not off the Richter scale. For a savoury snack product, at 533mg per 100g serve, the salt content is very reasonable. Regular corn chips contain around 25% fat (compared to 14% for Cobs). They are 100% wholegrain and made with high oleic sunflower oil, which is very low in saturated fat. How are they best eaten? You can eat these chips just as they are – naked and they work really well as the base for nacho’s. Perfect for lunch boxes too. It depends on where you get them from but they retail for around $4.00 for a 168g pack. To find out where you can locate them in Australia, click here at Cobs list of retailers. The Naked range is not stocked in the two major supermarkets (although their popular popcorn is), so you might need to look at the smaller independent stores.